Reference number for this case: 11-sep-54-Elliant. Thank you for including this reference number in any correspondence with me regarding this case. Mr. Correntin Couarch, 58, a farm worker living in Elliant, saw in the sky, 200 meters above sea level, "a luminous machine of which he cannot specify the form or the size." He said that, scared, he had turned off his bicycle light so as not to attract attention and had moved away quickly. At one kilometer, he said, he had looked back and saw the light stopped at ground level. The newspaper La Liberté du Morbihan gave a more dramatic version by claiming that the light had approached the witness. Near Elliant, a 58 years old farmer was frightened by a strange object which flew to some 200 meters of the ground and which suddenly went down and approached him. Note: on the photocopy of the article of this newspaper which was given to me by a colleague ufologist, vis-a-vis the word "approached," which was underlined by handwriting, appears the handwritten note "!? NO" doubly underlined. The author indicates that on October 11, 1954, close to Elliant in the Finistère, a 58 year old farmer saw a strange object flying to some 200 meters of altitude. Frightened, he fled. At approximately a kilometer of the scene, he looked back and saw that the object came towards him, very close to the ground. He was unable to give an estimate of the size or a description of the shape. Observation d'un objet sphérique au sol. QUIMPER. Mr. Corentin Couard, aged 58, resident of the borough of Elliant (Finistère), farm laborer, saw in the sky, with 200 meters of altitude, a luminous machine of which he can specify neither the shape nor the size. He was frightened and turned off the headlight of his bicycle, in order not to draw the attention, and he moved away quickly. At one kilometer from there, he turned round and stated to have seen light stopped at the level of the ground. The two authors indicate that on October 11, 1954 at an unknown time, in Elliant in the department of Finistere, a farmer observed a strange object evolving at 200 meters of altitude. The witness was unable to give a description of his observation. He specified that when he turned over he saw the object coming towards him very close to the ground. The source is given as Le Figaro for 10/13/1954. Luc Chastan indicates that in the Finistère, in Elliant, on October 11, 1954, at an nonknown hour, a farmer observed a strange object evolving at two hundred meters of altitude, and that he was unable to give a description of his observation, ensuring that when looking back he saw the object coming towards him very close to the ground. The source is indicated as "Ovni, Premier dossier complet... by Figuet M./ Ruchon J.L. ** Alain Lefeuvre publisher 1979". The website indicates that on October 11, 1954, in "Elliantbourg", France, an object was sighted that had an appearance and performance beyond the capability of known earthly aircraft. One object was observed by one witness, a farmer, in a pasture. The sources are indicated as: "Bowen, Charles, The Humanoids: FSR Special Edition No. 1, FSR, London, 1966; Vallee, Jacques, Computerized Catalog (N = 3073); Vallee, Jacques, Challenge to Science: The UFO Enigma, Henry Regnery, Chicago, 1966; Vallee, Jacques, Preliminary Catalog (N = 500, (in JVallee01); Schoenherr, Luis, Computerized Catalog (N = 3173); Hatch, Larry, *U* computer database, Author, Redwood City, 2002." Testimony nr. FR 29 370 1954 10 11 .. ..
Elliant is at about 16 kilometers of the city of Quimper. The inforamtion is too thin for any solid explanation. 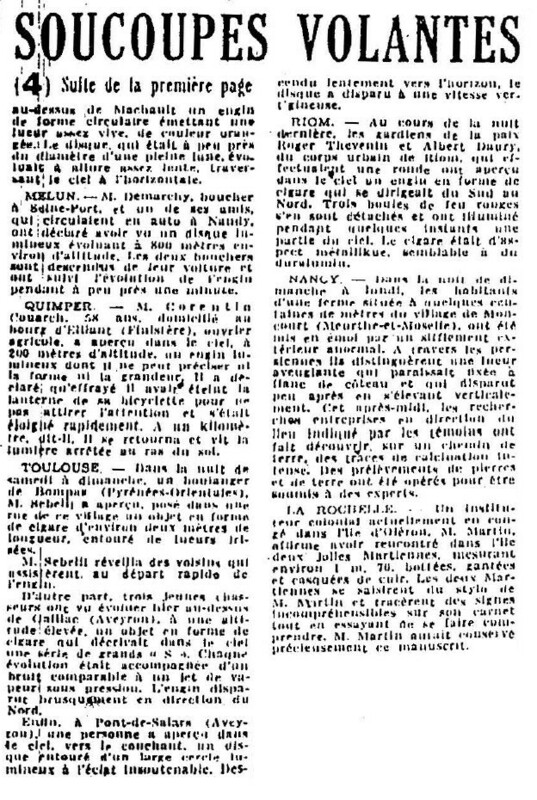 [lm1] Article in the regional newspaper La Liberté du Morbihan, #239, page 9, 1954. [---] Article in the national newspaper Le Figaro, October 13, 1954. [---] LDLN (Ufology magazine "Lumières dans la Nuit") catalogue. [jb1] "Fantastiques Rencontres du Bout du Monde", book by Jean-François Boedec, Le Signor publisher, France, pp 16-17, 1982. [fr1] "OVNI, Premier Dossier Complet des Rencontres Rapprochées en France", book by Michel Figuet and Jean-Louis Ruchon, Alain Lefeuvre publisher, France, page 152, 1979. 1.0 Patrick Gross December 16, 2008 Conversion from HTML to XHTML Strict. First formal version. Addition [ud1]. 1.2 Patrick Gross September 21, 2014 Addition [ha1]. 1.3 Patrick Gross February 7, 2017 Additions [ub1], [vo1]. 1.4 Patrick Gross April 6, 2019 Addition [lh1], Summary.